WASHINGTON (92 News) – The United States (US), Saudi Arabia and Spain have strongly condemned two separate attacks on election candidates in Balochistan and Khyber Pakhtunkhwa provinces. In a statement, US State Department spokesperson Heather Nauert said these attacks are cowardly attempts to deprive the people of their democratic rights. She said Washington will continue to stand with the people of Pakistan in their fight against terrorism. “We grieve with those mourning the victims, and hope for a rapid recovery of those injured. 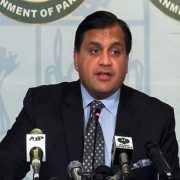 We will continue to stand with the people of Pakistan and the broader South Asia region in their fight against terrorism,” the spokesperson said. Saudi Interior Ministry, in a statement, assured that Saudi Arabia will support Pakistan war on terror. In his statement, Spain prime minister said that all the powers have to fight against terrorism collectively. Earlier in the day, a bomb blast targeted the convoy of Muttahida Majlis-i-Amal (MMA) candidate Akram Khan Durrani in a Bannu this morning. He, however, escaped unhurt while four people were killed and 14 others injured in attack.